The Buffalo County Stampede is a 5k, 10k and Half Marathon. It is the big fundraiser for the Buffalo County Historical Society. 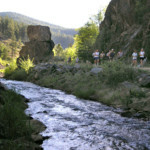 Our course is a mostly flat and fast run on hike/bike trails and city streets.